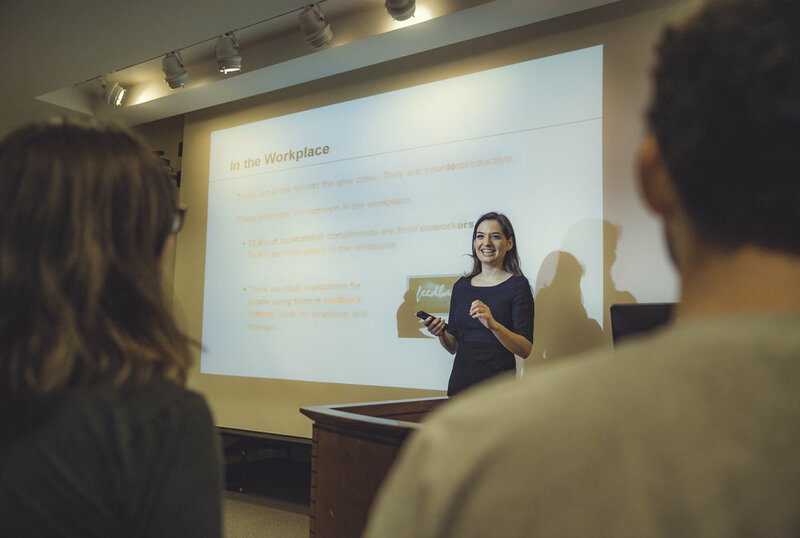 My goal as an instructor is to bridge classroom activities with real-world application so that my students leave courses equipped with the skills they need as future business and community leaders. This course examines the impact of individual, group, and organizational factors on organizational performance and employee attitudes. Topics include leadership, perceptions, attitudes, motivation, group development, norms and cohesiveness, empowerment, conflict, negotiations, culture, structure, stress, innovation, and change. This course enables students to develop their expertise in managing negotiations. It integrates existing theory and research with personal experiences and ideas. Using hands-on exercises, readings, and lively discussions, students build and hone their ability to understand, adapt to, and evaluate the personal, social, and situational dynamics of negotiations. This course examines economic and psychological influences on individual behavior. The applications of this framework include topics of procrastination, limited self-control, bounded rationality, choices under risk, markets, behavioral finance, consumption, savings, nudges, and public policy. This course is the study of linear algebra, the fundamental subject underlying large-scale computational problems. Examples draw upon everyday experience, economics, engineering, natural science, and statistics. This course is an introduction to multivariable calculus which is, on its face, simply the extension of the ideas of calculus from one dimension to multiple dimensions. This extension is worthwhile because in most areas of endeavor, functions are functions of more than one variable, and it incorporates geometric intuition, vector valued functions, optimization, and probability, along with other topics. Please contact me if you would like to access course material.